The new temperature sensor from Phobya with g1/4" inner thread and G1/4" outer thread respectively. With its compact design this sensor can be integrated into the cooling loop at virtually any suitable thread. Its timeless design makes it blend right into the system, especially as it's low height of only 11,6mm (without threads) allows it to fit below almost any connector or fitting. 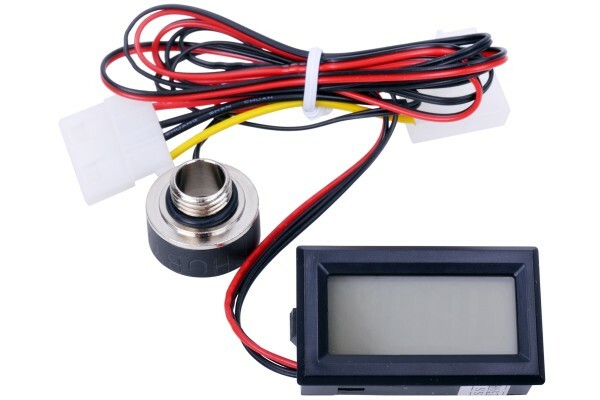 The display unit is connected via a 4-Pin Molex plug, the sensor is connected to the display via a 2-Pin lead and shows temperature changes very quickly.